Birthday cakes, anniversary cakes and celebration cakes in Eight Mile Plains Brisbane. To order cakes for Eight Mile Plains area please contact me. Visit the Design Range page to see more birthday, anniversary and special occasion cakes for Eight Mile Plains in Brisbane. Romantic birthday cake featuring hand made sugar paste hibiscus with gold highlights, pink rose and frangipani’s, with sugar paste lace. 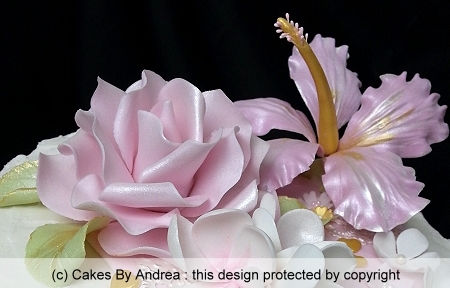 White frosted cake set on a pale pink fondant covered board.